After Saturday's messy and powerful storm Sunday was beautiful though colder and we enjoyed another brilliant sunset. 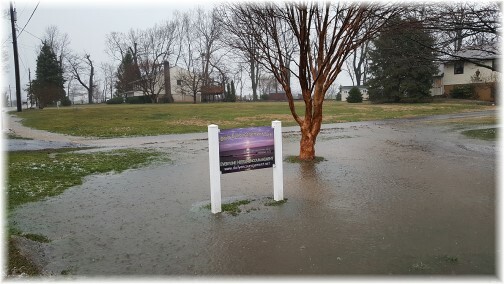 "The Storehouses Of The Hail"
Message summary: Today let us keep our focus on God, whose voice thunders in marvelous ways as He continues to do "great things beyond our understanding." He who works in the storm is also working in our lives this day. Often it's in the precipitous storm that He is speaking. Be sure to listen. He is in control and will have the final say! "God's voice thunders in marvelous ways; He does great things beyond our understanding. He says to the snow, 'Fall on the earth,' and to the rain shower, 'Be a mighty downpour.'" (Job 37:5,6). "Have you entered the storehouses of the snow or seen the storehouses of the hail?" (Job 38:22). 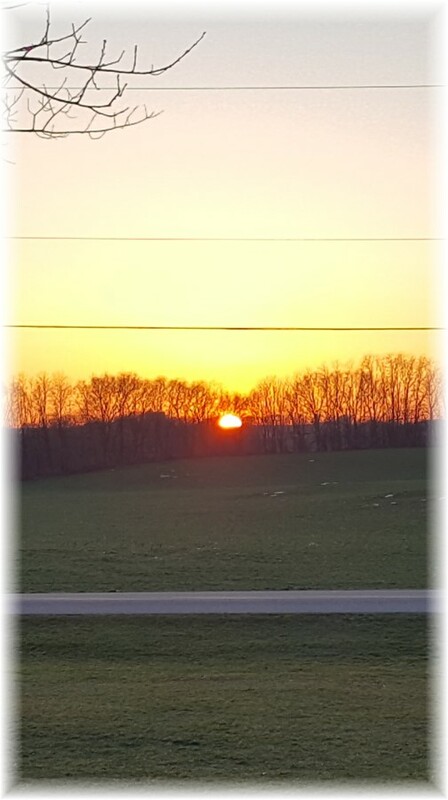 We had beautiful weather here in Pennsylvania all last week with unseasonably warm temperatures. On Saturday morning a friend came over to assist as I continue working on my backyard deck project. The morning was beautiful and calm but that afternoon everything changed in a matter of minutes. 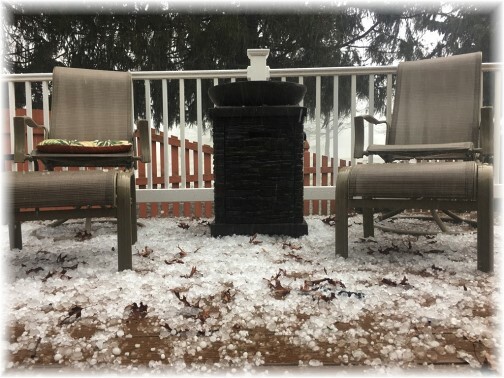 A powerful storm moved in from the west and plastered our area with high winds, sheets of rain and pounding hail, including a tornado touchdown of 90 MPH, only a few miles from our neighborhood across the Susquehanna River in York County. I think it was the worst hail storm I have ever witnessed. Marble and some golf ball sized hail pelted our house, in a horizontal sweep, due to the powerful winds. It lightly damaged our vinyl siding, destroyed our window screens on the west side of our house, and left some small dings on the hood of our new van. The northern part of Lancaster County experienced severe damage, mostly due to straight line winds. It was a fast and furious storm followed by driving rain and colder weather. Taking Ester to work half an hour later the tell tale signs of the storm's destruction included a "relocated" playland at the end of our road and straight across from there half the roof of our neighbor's barn was blown off. However the family and neighbors were already cleaning up the debris when we passed by. They were loading the metal roof scrap on a wagon for disposal (typical of rural neighbors coming together in times of need). 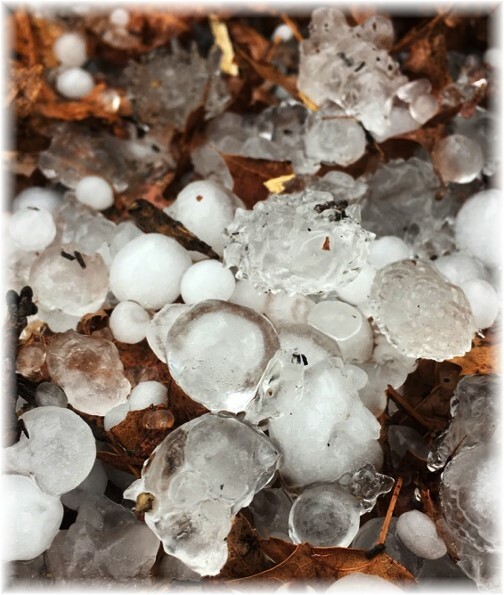 Hail is first mentioned in the Bible as one of the Ten Plagues in Egypt (Exodus 9) and last mentioned in Revelation 16 in a future plague, "From the sky huge hailstones, each weighing about a hundred pounds, fell on people. And they cursed God on account of the plague of hail, because the plague was so terrible." Wow! I'm thinking being hit with golfball-sized hail is painful, imagine 100 pound balls of hail! Hail pouring down from the sky is one of the rarer weather phenonomons. As a simple child-like image, it makes me think of God taking a handful of marbles, shaking them up in His hand and dispensing them to land wherever they might choose. I recall walking to school as a storm was approaching with my friend, Dave, when we were in third grade. I looked up at the sky and commented, "It looks like hail." Dave, who was raised a devout Catholic, scolded me: "You shouldn't say that word!" In his innocent mind he thought I was saying "hell" as a curse word. The first daily verse is part of the speech of Elihu, who spoke following the exchange between Job and his three friends. I enjoy reading Elihu's perspective, although God certainly has the final word at the end of the book. Snow, rain and even hail are reminders of God's providential ruling over all the earth. "God's voice thunders in marvelous ways." Let us seek to have a perspective on life in which we hear God's voice in the silent falling snow, the splattering rain, the mighty winds and even the occasional pelting hail that falls from the sky. Marvel at the variety of ways God speaks to us and provides for our spiritual and physical needs. Each element of nature has a divine and practical purpose. We may speak of how it inconveniences our life, alters our schedule, damages much along its path, racks up repair bills, or even causes injuries or deaths. Or like Elihu, we may simply remember this plainly spoken truth, "He says to the snow, 'Fall on the earth,' and to the rain shower, 'Be a mighty downpour.'" It's His ways and we do well to recognize He sovereignly rules over His creation. Witnessing God's almighty power puts mankind's limited power into proper perspective. "He does great things beyond our understanding." This is a great verse to ponder. What He does is great although it may go beyond our finite understanding, leaving questions and mystery in our minds. It might make no sense at all to us. The second daily text states, "Have you entered the storehouses of the snow or seen the storehouses of the hail?" (Job 38:22). Our lives and this world are subject to His sovereign design, His eternal time table, and even His own hidden storage houses. Today let us keep our focus on God, whose voice thunders in marvelous ways as He continues to do "great things beyond our understanding." He who works in the storm is also working in our lives this day. Often it's in the precipitous storm that He is speaking. Be sure to listen. He is in control and will have the final say! Daily prayer: Father, we recognize Your handiwork in nature and we welcome Your handiwork in our lives, though it will include some days of stormy weather, including the painful pelting of grief, sorrow, loss and disappointment. But the good news is that the sun will rise again, we'll see the dawn of a new day and our countenance will brighten with the eternal hope given to every believer. Help us to look to You and trust Your sovereign plan to unfold in our lives day by day, year by year while we look to You as our Solid Rock, our Hope and Stay! It is the only real and lasting stability we have in our life's journey. We pray this in Jesus' name. Amen. Front lawn view right after the first storm. 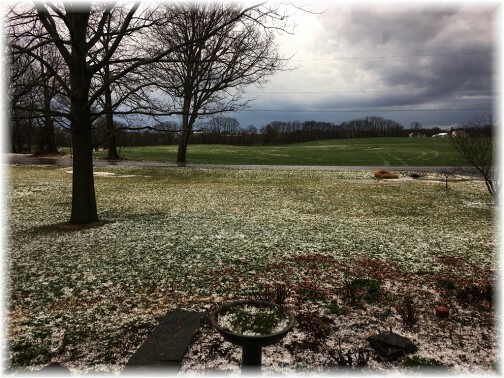 After hail fell the second time the landscape was covered, looking like a blanket of snow rather than hail. Our deck only minutes after Brooksyne had carefully swept it! The hail particles were marble sized, though some merged together the size of golf balls. Friends who live about 1½ miles away had mostly golf-ball size hail and more damage. After the hail we had a heavy downpour of rain that flooded our yard. Thankfully no water in our home! 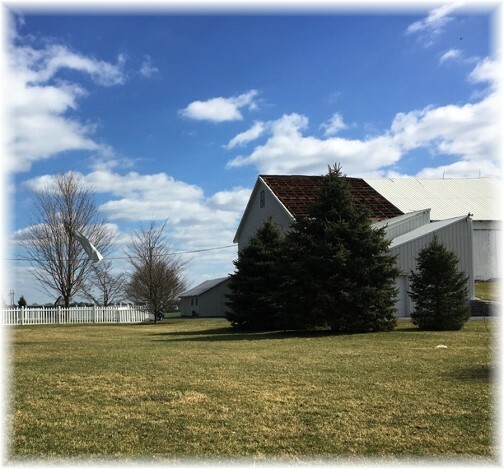 Yesterday, on the way to church, we surveyed the damage to our neighbor's barn at the end of Kraybill Church Road. The storm took off an entire section of the westward facing roof and left one large section stuck in a tree (to the left). Article about storm damage in Lancaster County with many photos.